TATTERS LOVE TO PLAY ! What does a tiny heart filled with love do ? It multiplies & spreads it’s love around ! One such tiny heart did just that & in the process gave me a designing idea. I’ve always found it difficult to design a 2D piece with regular/repetitive elements – how to connect elements, how to jump to the next element nicely, how long/short should the chains be, how large/small should the rings be, where should the joining picots be, etc. etc. etc. After all, the final piece Must lie flat !!! As late entrants to the online tatting world, we have a huge advantage, alongside a minor disadvantage ! With all the wonderful tutorials, patterns, tips & techniques shared freely, we don’t have to reinvent the tatting wheel. So this technique may not come as a surprise to experienced & creative tatters. But for me, it was like finally breaking the glass ceiling on 2D tatting design creation. So, here is a slice of my own joy in taking a step up the learning ladder! Peace and Tolerance Tiny Heart designed by Mónica Manceñido seemed like (and is) a very simple pattern. Ah, but appearances can be so deceptive . Why ? Because it hides within it the potential to multiply into varied shapes & patterns in a repeatable arrangement. It is an immensely versatile & adorable little heart :-) It is quite the stash-buster too . I enjoyed tatting this simple, tiny heart for itself & quickly had 6 of them, in addition to 2 more that I joined together to form a diamond, using picots & chains, in one pass. For heart motifs, an SSSR (Single Shuttle Split Ring) to end, thus avoiding tying, cutting, hiding ends. The diamond motif (above right), is a simple mirror image, without changing stitch count. To avoid sewing in tails, I did a split chain to end. As a designing element, it is a tatter’s delight !!! Multiples of these hearts, with picots in appropriate places, can be combined & adapted to create larger motifs, beautiful diamond shapes, edgings, bookmarks, crosses, insertions, medallions, snowflakes, motifs, bracelets, pendants, necklaces, etc. even butterflies …. Once the placement has been finalized, identify the points where they would join to each other. These are the points where a picot is required. Hence, make sure to add a picot at all the required places. In the images below, I have not explicitly shown the picots ; they can be visualized easily enough. When designing for beginners, one can tat each motif individually, and join as required. So, start with 1 complete motif (this could be either the tiny heart or the diamond, with picots incorporated). Tie & cut threads. Start 2nd motif & join to corresponding picot on 1st ; complete & tie & cut. Start 3rd, & join to 2nd and so on, till you get your desired shape & size. But we now look for motifs/patterns that can be done in one pass, with as little tying & cutting as possible. That’s when Split Rings, & similar techniques come into play. Without changing stitch counts in all the following arrangements, one can complete the entire pattern in one pass, using SRs in the right places. For some, one may need to change an element. Eg. 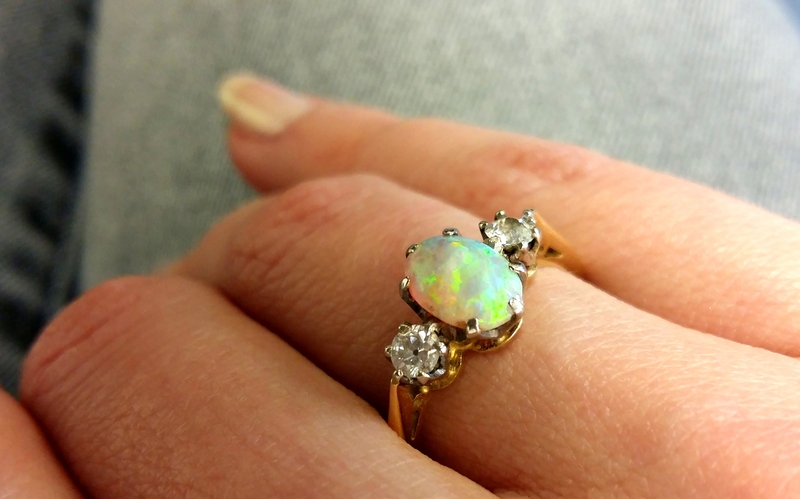 a ring may be changed to chains, thus facilitating a return back to the start , without any breaks in between. Split Rings may still be required. This is a great idea, or should I say a "Lazy Tatter's" idea, to create patterns using a small element/piece. It neither takes too much of designing effort nor many mis-trials. The size, shape, joining points, etc. emerge from the positioning itself. All one needs is to add the "missing pieces" whether it is a picot, a ring, a chain, etc. One can even consider Eliminating an element wherever required ! Or how about adding another round to the placement ! By positioning tiny motifs farther apart, one can get a hexagon, octagon, or other polygonal structures. The mind boggles at all the possibilities ! The 5-heart motif can also be done in one pass by Adding a chain & using SRs. (as shown by black lines in the figure below) Or one can add longer chains & an occasional ring around the periphery as a 2nd round. Here is an example of a pattern Within a pattern. "Elementary", did you say ?! TIP : Triangles & squares are perfect for a beginner in designing, because adjacent motifs snug up well together. Circles, on the other hand, leave more gaps/spaces between them that may require additional patterns to fill up. I have only depicted small arrangements & braids. These can very well form the basis of larger coasters, mats, & doilies, too. Some may require a Split Chain, a Split Ring, a Mock Ring, or some other advanced technique to make, connect, or move to next element. Since I have not Actually tatted them, only arranged them & taken photos, I cannot claim that All of these will actually turn out the way they are photographed. These are possibilities to try out. And more importantly, this is one way of creating a design/pattern easily, using existing tiny motifs – be it in the shape of a triangle, square, circle, & so on. In my next post, I will share the pattern for a 3D Poppy flower based on this very Tiny Heart pattern. UPDATE : The pattern for 3D Poppy Flower, is uploaded in 2 parts. I will convert to pdf file soon. Leanne shared a lovely tatted Acorn pattern on InTatters (now Craftree) (and facebook ). The chains moving sinuously to & fro, filling in the nut, as well as the scalloped mesh on top (cupule / involucre) is a visual delight ! I followed Frivole’s Split Chain (Traditional Tatting) video tutorial . Initially, I was a bit confused – which loop/thread to pull, etc. However, then it struck me that she is actually doing the CWJ stitch ! After that , it was easy-going. Here I used Jane Eborall’s “Making a Split Chain original method” which was even easier with tatting done all from the front. I also did directional tatting (FS/BS) for the chains in this trial. Picots for the bottom should be normal to just a bit longish ; not on the smaller/shorter side. If these are short, then the tatting will not lie flat at joins. An individual’s tatting tension may require some alteration in stitch count. I think I may have tatted just a bit tightly, hence needed an extra stitch in the bottom chains. Or it may just have been a difference in thread types. I used 2 types of joins. Make loop with shuttle #1 & pass ball or shuttle #2 thread through this loop & tighten ; and, Lock join . One can either use 2 shuttles Or a shuttle & ball. For bottom I used shuttle & ball; for top I used 2 shuttles CTM. For the top, I wound 104 inches CTM in 2 shuttles. I designed an acorn/oak leaf, in keeping with the to-and-fro chains in the acorn. In nature, the leaf is supposed to be much larger. But that would take the focus away from the beautiful acorns. Hence I left it 'incomplete' & it kinda seemed okay in the photograph. Size : ~ 2½ inches across & ~2 inches long. Another enjoyable tat, though I am not too pleased with the result. I “hope” to do better next time. I really liked the Thrown-Off Rings used in this pattern to get a lacy filling within & a scalloped border too ! This cute little, very simple, ring-only Hummingbird for Beginners pattern, was shared on InTatters a few weeks back. I was delighted by the smooth curve & natural flow of the neck, totally in keeping with the real bird shape ! And such a lovely stash-buster, too. Who wouldn’t like to have a few hummingbirds hovering over flowers ?! Threads : Anchor Mercer Crochet Cotton, Size 20. Lemon Yellow ; Variegated Purple ; Metallic Silver & Green. USP : The Downward Picot for neck -which gives it a natural flow & continuity of form, clearly reminiscent of an actual bird. This one is my own ‘variation’ substituting the ring with chain, using shuttle & ball. In this Trial 1, I made the eyes as tiny picots & the neck with Turn Work (half stitches), but kept the overall stitch-count similar to the original. For the beak, I left all 4 tails (shuttle & ball) tied together for a fuller look.. But I was unhappy with the overall shape. In 2nd trial, which I like much better shape-wise (though it still requires a neater finish & untwisted picots), I have used very small DPs for eyes & a DP for neck (the reason I took a liking to Sarah’s pattern!). I’ve added a couple of ds, too. I just noticed that the hummingbird in the last photo looks positively frazzled !!! Oh well, too late to take another pic. TIP : When doing DP (or TW), I always make 2SHS, p, 2FHS. I find that this gives a a very clean turn since there are now 3 contiguous half stitches of same type at each end. Make the loop for picot & make the 1st half stitch. Then move/snug this half stitch into position. Only Then complete the 2nd half stitch. I used to make the complete ds, then snug it in place. But this causes the LP to twist, as can be seen in some wing picots. My hearty thanks to Jane McLellan , for graciously sharing this pattern & answering my queries. It was her beautifully tatted version that inspired me in the first place. This is a quick project to tat for self or as a gift to any book lover ! Each new project, complete & beautiful in itself, is a learning process for me. I use it as an opportunity to apply my learning, without any disrespect to the designer. This bookmark, too, saw it’s fair share of my cheeky tweaking (solely for my own learning!). A real Morning Glory flower has a subtle frill around the periphery. To capture that in 2D, I remembered something stored in the back of my mind. Fox’s “mistaken” DDS. I loved the texture it creates & was glad of the opportunity to use it here. It is basically sets of (2FHS, 2SHS) for required length. A padded Josephine Chain. Each half stitch is padded, giving a broader chain & the spiraling is further apart. It is not, however, very flexible. After a couple of leaves, I switched to frontside (modern) tatting, Teri Dusenbury style (which I learned in the Dandelion Chain Link Bookmark). Luckily I was working with 2 shuttles, hence the switch was possible. This frontside tatting required a combination of rods & rs, both in rings & in chains, by switching shuttles as & when required. The fun part was that I no longer needed to reverse work – everything was tatted with the front facing me at all times !!! TIP : The leafy vine makes a nice pattern for a braid or bracelet or even an edging. Another project that I enjoyed immensely, consolidating my learning. A beautiful cluster of 3 hibiscus flowers loomed up one day in pinterest . They were by Umi & Tsuru, but with no link to the exact post/page. So it went into “inspiration”. The very next day, I stumbled upon Crazytatter's (Grace) project on Craftree ! 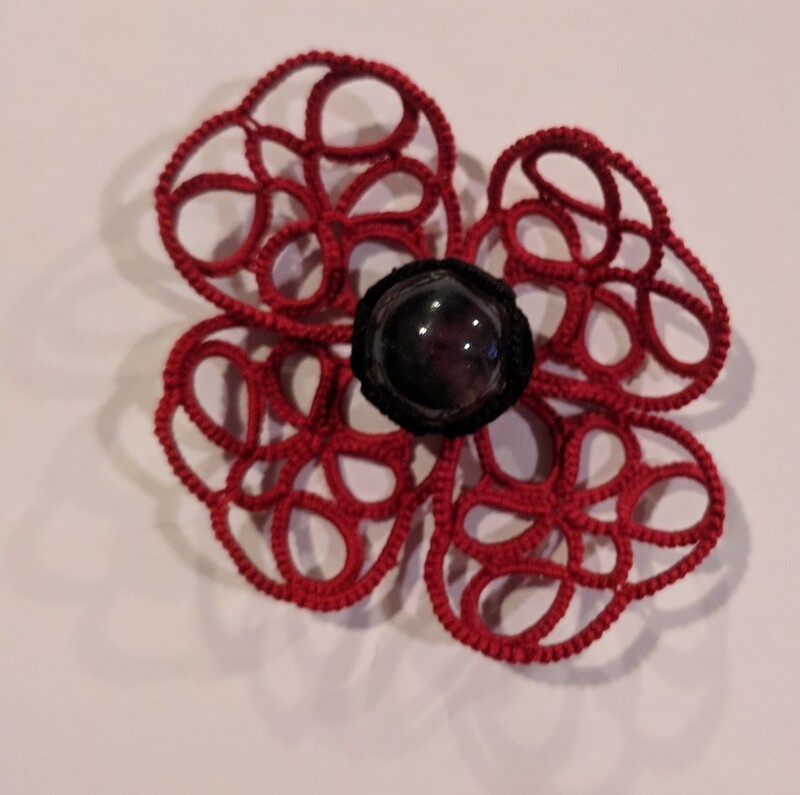 She had done a wonderful job of tatting the piece And she had also added links to the free pattern, as well as a Great tip from Jane McClellan ! Originally, Wally's pattern is done in tatting and crochet. However, creative tatters have converted it into an all-tatting pattern, giving it a beautiful dimensional look – from a flat hibiscus to one that comes alive in 3D ! The flower measures about 2 inches across (3D), without lying flat, when done in size 20 thread. 1. I would decrease the length of the very first large picot in the center just a tad. It is ½ inch in length … which is ideal for 6 petals. Hence a little less would do for 5 petals ..
2. It can be done in one-pass if 2 shuttles are used, each filled with a different color. a) If one starts with the pistil – right at the very tip, & goes down to the center, then each ring with petal …. The first yellow center ring will have to be done in SSSR to keep the color same. b) Do not cut the thread after Round 1. 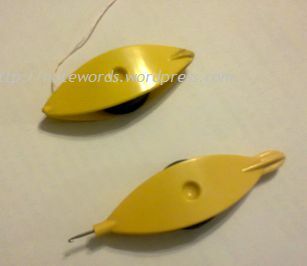 Carry on with the 2nd round, using CWJs to hide the yellow thread …. 3. The CWJ idea from Jane works incredibly well! It gives the edge a smooth & even finish, without the use of crochet. This truly is one project where the CWJs work like a charm for that smooth edge ! 4. In Round 2, each petal starts & ends with 6 chain as per original pattern. I used a variable of 6 & 7 ds. This causes the petals to overlap slightly. One can start with 6ds, join the picots, & end with 7 ds for each of the petals. 5. In Round 2, between picots, I mostly used 3 ds, but interspersed with 4ds once or twice in each petal. No particular order…. Just eye-balled it. 6. In order to close the SCMRs, I used Jane Eborall's method to avoid blips (Closing a Self Closing Mock Ring – 2 ways. I used the 2nd method explained there). Love it !!! 7. The JRs have a variable count too – starting from 7 half sts for the topmost one, through to about 12 half sts for the 6th/last one. The 1st pair of leaves (pic on left) was tatted earlier for another flower & I kind of liked the arrangement. But since these differed in shape & colour from the actual Maga leaf shape, I made a new pair of leaves, in keeping with the pattern of the tatted hibiscus petals (with picots emanating from the central ring). Both pair of leaves are my own pattern. If anybody is interested, I can share the stitchcount & pattern of both pair of leaves. Please leave a comment or email me. I had tatted the Maga leaf pair separately, then sewed it on to the base of the flower. Then the flower, with leaves was tacked on to a hair band for my niece.